Tate Britain has unveiled a major new commissioned work by Mike Nelson. The Asset Strippers has been created for the annual Tate Britain Commission, supported by Sotheby’s, which invites artists to create a new artwork in response to the grand space of the Duveen Galleries. Mike Nelson has transformed the heart of Tate Britain into somewhere between a sculpture court and an asset strippers’ warehouse, carefully selecting objects from a past world, the post-war Britain that framed his childhood. The Duveen Galleries’ origins have informed Nelson’s project as the first purpose-built sculpture galleries in England, intended to rival the sculpture court at the British Museum and the V&A’s cast room, turning the neo-classical galleries into a warehouse of monuments to a lost era and the vision of society it represented. The artist has scoured online auctions of company liquidators and salvage yards to amass a collection of objects which point to the decline of British industry, infrastructure and the welfare state. 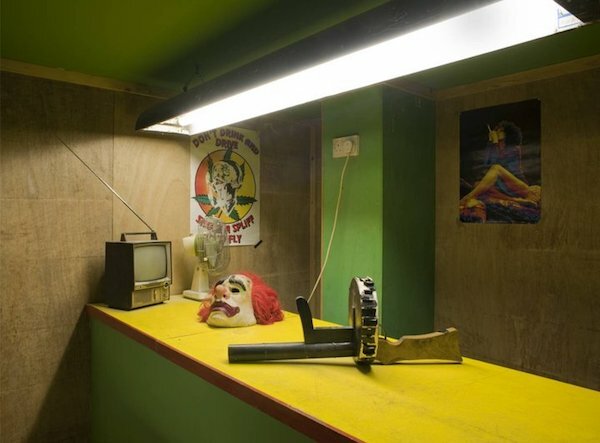 Similar to the ancient artefacts displayed in museums, The Asset Strippers presents remnants from a bygone era: knitting machines from textile factories reminiscent of the ones he grew up around in the East Midlands, woodwork stripped from a former army barracks, graffitied steel awnings used to secure a condemned housing estate and doors from an NHS hospital. Presented together in an installation which fills the Duveen Galleries, Nelson creates a melancholic journey through Britain’s recent social and political history.